St George’s is situated in the south east corner of Belfast city centre, a stone’s throw away from the relatively recently redeveloped waterfront area. I know it is a stone’s throw away because many a stone has been thrown in this general area over the years. However, on a relatively sunny Sunday morning in a more placid era the cycle from home to the market is a somewhat more pleasant experience. 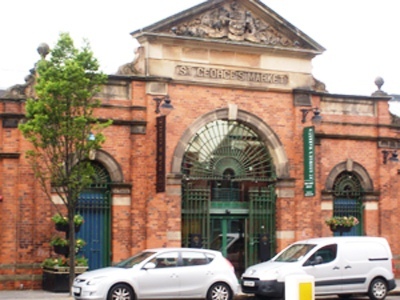 The market is well over 100 years old, having been commissioned by The Belfast Corporation in 1890 and completed in three stages by 1896. The market is one of my oldest and fondest memories of Belfast. In the very early 80s I remember quite vividly being brought to the market by my mother and being amazed by the sheer size, smells and colours of the place. What amazed me most of all was the swarm of strange and unusual faces, not that there was anything Picasso-esque about Belfast people in those days. It was just exciting as a four year old to see that many people in the one place towering over me going about their business. The place was a great spot for people watching, a pastime that I’m still partial to today. In its vast hall, beneath the partial glass ceiling countless lines of market stalls sold all the usual fruit and veg, bric-a-brac and fresh fish. In the middle of the market a pet shop stall stood where I was presented with my first ever pair of goldfish and bowl which were given suitably imaginative names no doubt. I’m sure it was a logistical nightmare for my mother to take charge of a four year old hyperactive child and all of the pet fish paraphernalia which now occupied his attention on the 25 mile train journey back to the homestead. But this she did, on several occasions, because, as you may know it isn’t long before pets like these end their days with a short but loving ceremony finished with the sharp flush of a handle. 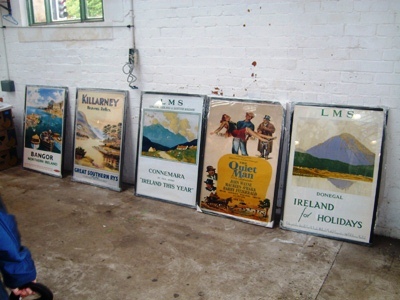 The market, like a lot of Belfast, fell into decline and closed for a number of years. Nevertheless, it rose again with a little help from a lottery grant in the late 90s and now enjoys tremendous popularity among locals and tourists alike. Walking through the market as an adult it is still a great place for people watching, only now I think I tower over the majority of the interesting people who are making their way around the multitude of stalls which still provide people with their fruit, veg and other traditional food stuffs. However, as Belfast has grown ever so slightly into a multi-cultural city of sorts, this is reflected in the variety of delicacies from around the globe which are now offered to its many visitors. People in search of treats for refined palates are usually catered for on Fridays and Saturdays. Sundays are centred towards those who are on a quest for something a bit unique. St. George’s has thankfully been permitted to bypass the ‘thou shalt not’ inspired Sunday opening times which apply to the majority of trade and retail outlets on this part of the Irish rock. 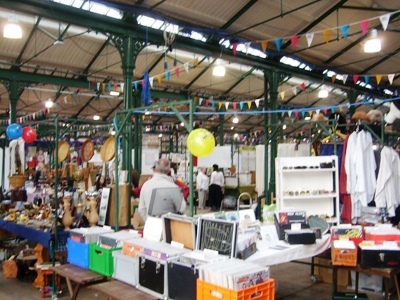 It is now a hive of small scale entrepreneurs exhibiting their wares, from antique books to Irish bog oak carvings to recycled goods, arts and crafts (although I have been reliably informed by one of the stall holders that they prefer the term ‘upcycled’) and the latest in solar powered gadgetry. One of the more interesting products on display today is a continuation of sorts of Belfast’s once world famous linen industry, when the city was known as ‘Linenopolis’. 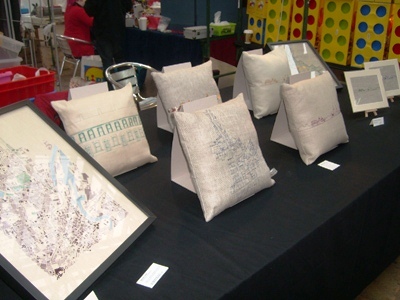 Stitched onto unbleached Irish linen are maps and images which chart the changes of the city’s pattern throughout its history. This is only one of many items which are unique to this bustling market. Throughout the years, the indoor market hasn’t always been alive with the collective din of hundreds of voices buying, selling and coming together for a stop and chat. In the aftermath of Easter 1941 the market, sadly, took on the role of an emergency mortuary in the wake of one of the more sombre periods of the city’s recent history, the Belfast Blitz. Over 700 people lost their lives as a result of the bombardment of the city and over 200 of those victims had to be brought to the market for identification by loved ones. 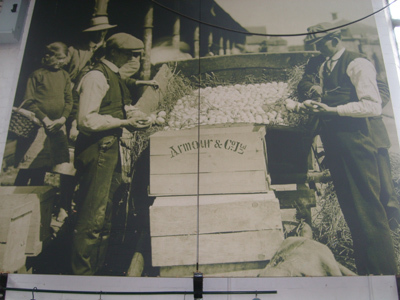 This incident is commemorated in the entrance to the site alongside many other happier images which celebrate this landmark building’s century plus history. This entry was posted in Memory, Places on July 10, 2012 by Paul Scraton. Your description of being at St George’s with your mum, Barry, instantly brought back memories of Saturday mornings with my mum at Birkenhead Market before heading to Anfield to watch Liverpool with may Dad, sitting on his knee, in the afternoon. The market was an amazing place, but the cheap orange squash and chocolate never quite lived up to expectations! My mum worked part-time at Toll’s, a women’s clothes shop on Liverpool’s affluent Bold Street (now home to one of the UK’s best alternative bookshops: News from Nowhere). She couldn’t afford to buy any of the stuff she handled as she served the ‘great and good’ of Liverpool and its surrounds. But she had a great eye for dress-making. When the shop closed she’d lay out the latest fashions on the Liverpool Echo, draw around the dress using tailor’s chalk and then head to the Market on a Saturday to buy expensive off-cuts from Eli’s stall. He was brilliant, standing on a tea box above the crowd with all sorts of gear and a banter that would shame most of to-day’s stand-up comedians. The call from the assembled throng was “E’y’are, Eli” securing the bundle. It was only time I heard mum raise her voice! Amid the hilarity and chaos she would have her material at ridiculously low prices, head home, and spend Sunday at her old Singer sewing machine, a family heirloom. On Monday she’d walk into work wearing the very dress on the rails … but in best Birkenhead Market material. You might be interested in this documentary made by NvTv, Market Memories.